NOAA Office of Coast Survey Jul 30, 2018. 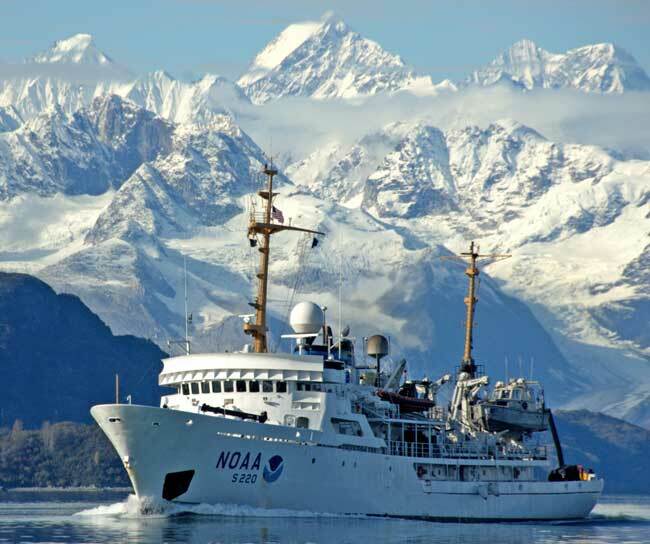 In July and August, the crew aboard the NOAA Ship Fairweather is fulfilling a piece of the U.S. Arctic Nautical Charting Plan as they conduct 566 square nautical miles of hydrographic surveys in the vicinity of Cape Lisburne and Point Hope, Alaska. Seventy percent of this area has never been surveyed, while the remaining 30 percent has only lesser bottom coverage from single beam surveys conducted in the early 1960s. The data will be used to produce nautical charts that align with Coast Survey’s new rescheming efforts as stated in the National Charting Plan. This is one of seven hydrographic surveys NOAA has planned in Alaska for 2018. The data Coast Survey collects is the first step, as exploration is an iterative process and bathymetric data provides a foundation from which to build. The benefits of surveying extend beyond safe navigation. Accurate seafloor depths are important for forecasting weather, tsunami, and storm surge events that affect local communities. Bathymetric data also informs the discovery of seabed minerals, historic wrecks, and natural resource habitat mapping.As with any new endeavor, there is a balance between exploration, safety, environmental conservation, and commerce. Lt. Bart Buesseler is Coast Survey’s regional navigation manager for Alaska and works directly with Alaskan communities, mariners, and port authorities to communicate local needs, concerns, and requests. As many Native Alaskan coastal communities still rely on subsistence hunting of marine mammals, these changes in ice and vessel traffic create a direct impact to their way of life. With that in mind, Lt. Buesseler works with communities and maritime users to identify the priorities that will best support the needs of an area while still addressing the concerns of the communities. It is through this collaboration that the balance between exploration, safety, conservation, and commerce can be achieved.